The South Dakota Health Insurance Exchange recently released premium rates for health insurance plans that will be offered on their individual and small business "SHOP" exchanges ("marketplaces"). The South Dakota Health Insurance Exchange, offered through the federally-run exchange, will be a new way for individuals and small businesses to shop for health coverage. The plan rates have been approved by the State of South Dakota. Final plans will be available for review and enrollment starting October 1, 2013 at healthcare.gov. All carriers offering plans through the exchange are required to offer at least a silver and gold level plan. Most are choosing to provide bronze and platinum plans as well. All plans will cover specific essential health benefits. 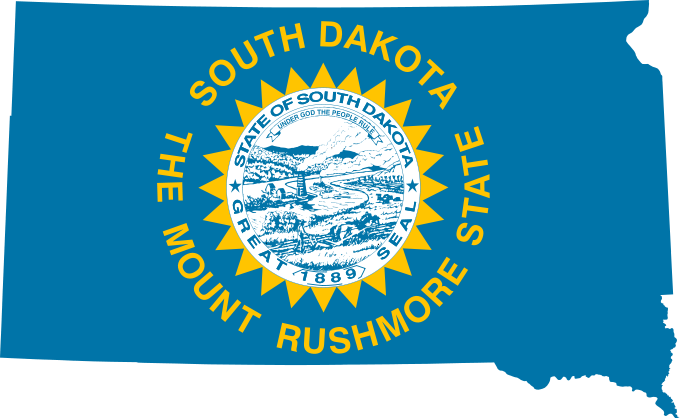 The South Dakota Department of Labor and Regulation (DLR) has provided sample rates for four regions, available on their website. These rates are listed for both the individual exchange and the SHOP exchange. 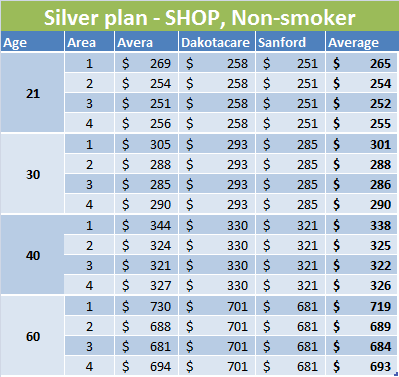 The following tables list the average silver plan rates for the individual and SHOP exchanges. Area 4: Sully, Hughes, Hyde, Hand, Buffalo, Jerauld, Sanborn, Miner, Brule, Aurora, Davison, Hanson, Douglas, Charles Mix, Hutchinson, Bon Homme, and Yankton. For a more detailed outline of the rates, along with the rates for the other levels of plans, see the South Dakota DLR website. Six health care groups have been awarded a portion of a $150 million grant, which will be used to educate and assist people to comply with the Affordable Care Act (ACA) mandate that requires all individuals to be covered by a health insurance plan or else pay a fine. The following table lists the 10 health care centers and the portion of the grant each has been awarded. Currently, 92,441 South Dakota residents are uninsured. Of those people, it's estimated that 90% will qualify for individual health insurance tax subsidies. 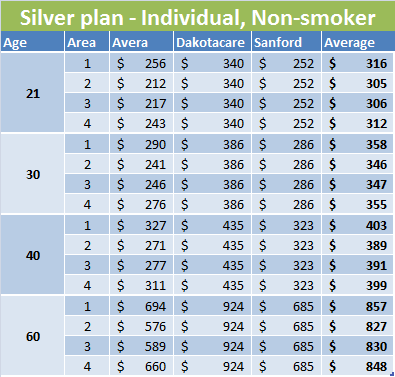 The individual health plan rates listed above do not reflect the application of the tax subsidies, which will lower the cost of the premiums for many South Dakota residents purchasing individual or family plans.